I bought this Drill Combo for my husband and we use it every single day. No kidding. It has an impact driver and a drill. They are lightweight and strong. 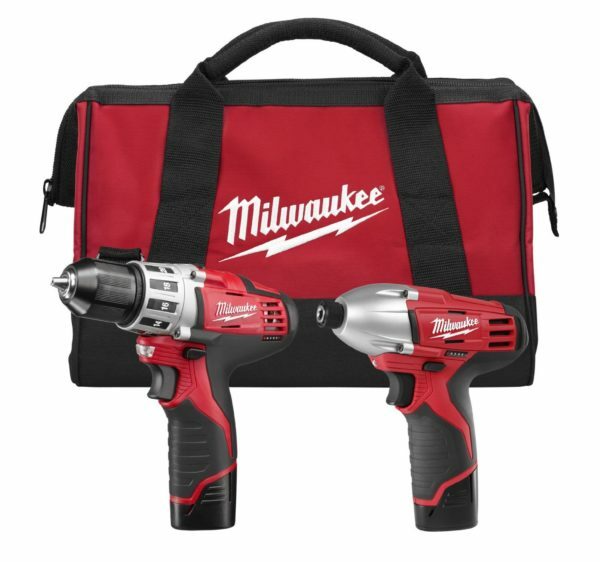 You might be wondering why you need both- the impact driver (my fav!) is for driving screws, while the drill is more for drilling holes, etc. Both are important. You can buy this set here. 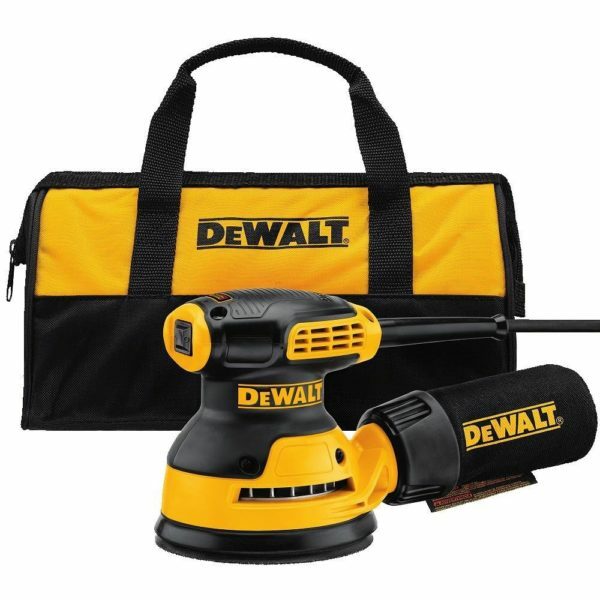 The first tool I ever owned was this Dewalt Palm Sander. I use it a ton for crafting, when I’m distressing things, and when I want a super smooth finish. I would never go back to sandpaper after using this baby. You can purchase the sander here. Oh, and don’t forget the sanding pads. *** editor’s note *** since I posted this, I got a Ryobi Corner Cat sander, and it has pretty much changed my world. I honestly use it all the time. I love that the sander can get in hard to reach places, and it is battery operated. Oh, and it is a great price! I would highly recommend it. As far as saws go, the Compound Miter Saw is a must! 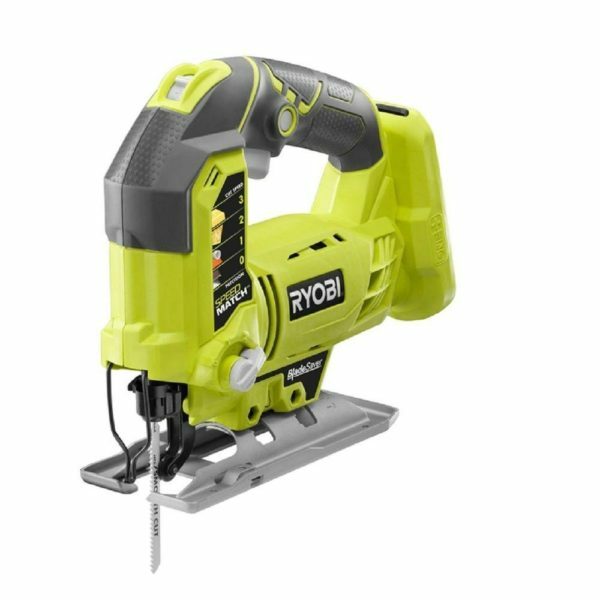 This one from Ryobi is perfect, because it slides, it can rotate and pivot, and it’s got those cool guides on the side, so your boards don’t come crashing down after you cut your wood. You can buy this saw here. If you plan on building any type of furniture, the Kreg Jig is a MUST! I have the K4 system, and it has been great! I use this a ton (like on my 2×4 bench, my farmhouse bench)! 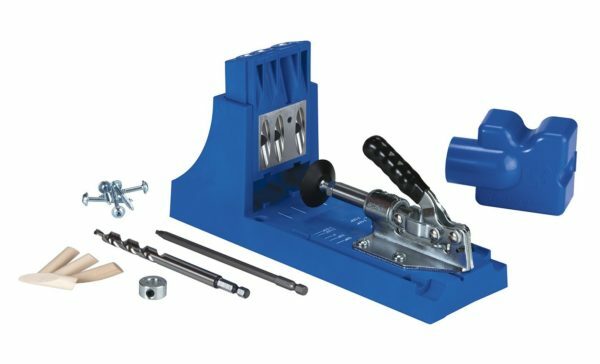 You can purchase the Kreg Jig K4 system here. If you’re doing any finish work at all- like installing Board and Batten, a Brad Nailer is such an important tool to have. I love the AirStrike series from Ryobi, because it doesn’t require a compressor or hoses or any of that nonsense. And it is cordless, which I love! 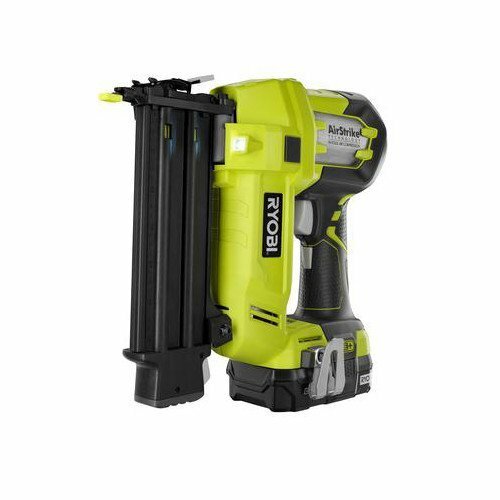 If you have any other Ryobi 18v One+ tools (like this impact driver that I have), it uses the same battery, so you don’t have to worry about keeping a bunch of different batteries and chargers around. Makes life sooo simple and easy. You can buy the Brad Nailer here. Another thing that I sometimes over look are Clamps. I use them SO much! But they aren’t a power tool, so they don’t get a lot of attention. 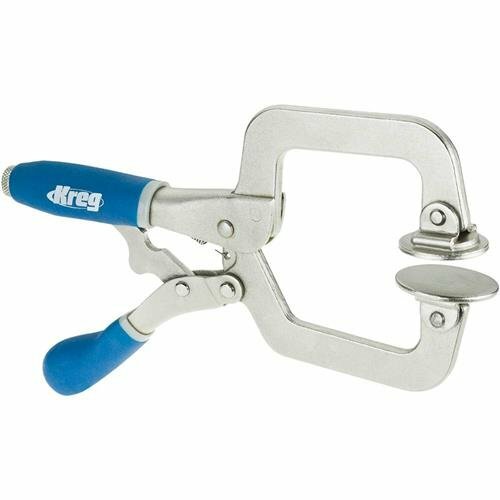 But I absolutely love these face clamps from Kreg. These are the exact clamps I use, and I love them! I love that they are truly one handed clamps- you don’t have to adjust anything when you’re clamping. They have cool plates on them, so they don’t dent or scratch your surface, and they hold tight- which is most important! You can purchase these clamps here. The main saw I use is my Miter Saw (above), but it’s nice to have another saw around. I honestly have a hard time deciding between a Jig Saw and a circular saw. I would choose the Jig Saw, because it cuts cute curves and tight angles, but my husband uses is circular saw all the time. Either saw is great. Oh- I will say that a cordless saw is a must- my husband has cut through his cord before, which is a bummer. So I like both of these saws I’ve shared because they use the Ryobi 18v One+ battery, so you can swap your battery between your tools. 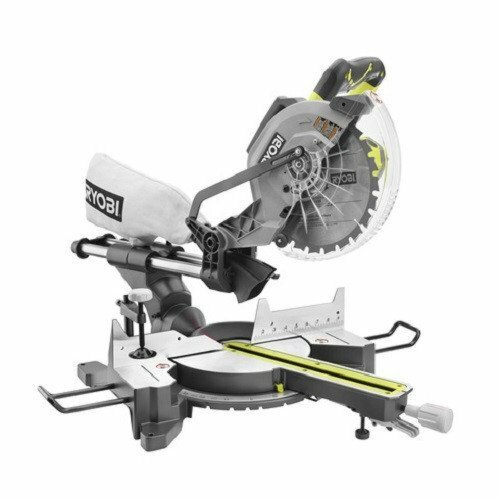 You can purchase the Jig Saw here and purchase the circular saw here. Another must have is a simple Tool Kit which includes measuring tape, level, pliers, hammer, etc. I keep mine in my kitchen and use it to hang pictures, open tight lids, that sort of thing. I think every household needs one. 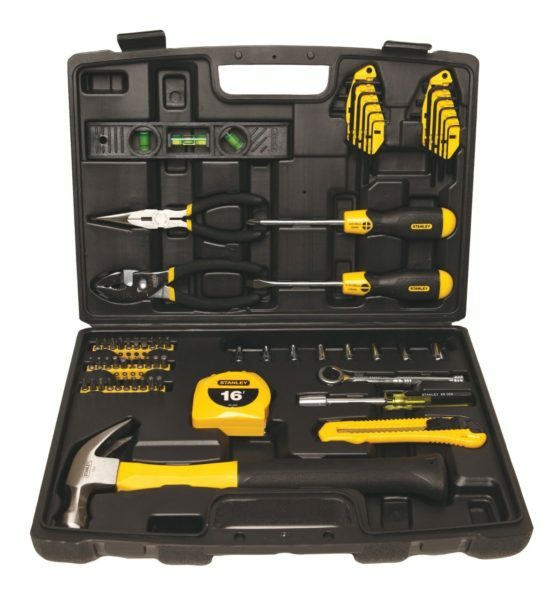 You can buy this tool kit here. A Paint Sprayer is more of a luxury than a necessity, I think. But oh my goodness! I will never go back to painting furniture again. I love, love, looooove my paint sprayer. I have this Finish Max by Home Right, and my number one concern was how hard it would be to clean. Well, friends, I was worried about nothing. I have the rapid clean kit and the spray shelter, and I seriously don’t even change into my paint clothes, because it’s SOO quick to clean and I don’t have any over-spray at all. 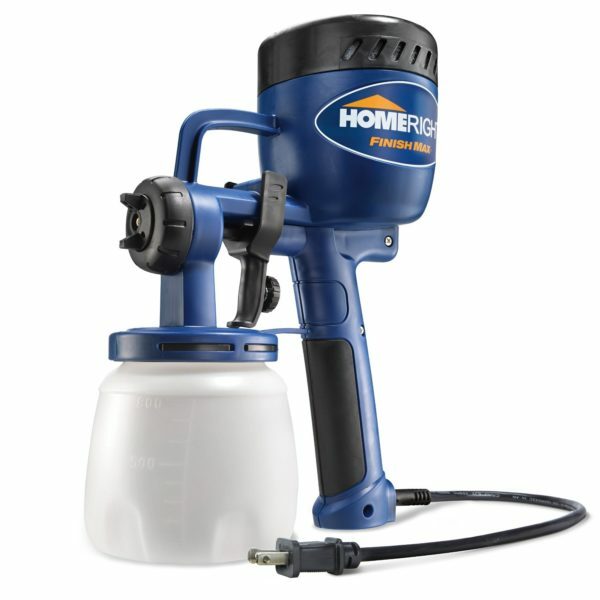 You can buy the Finish Max Paint Sprayer here. 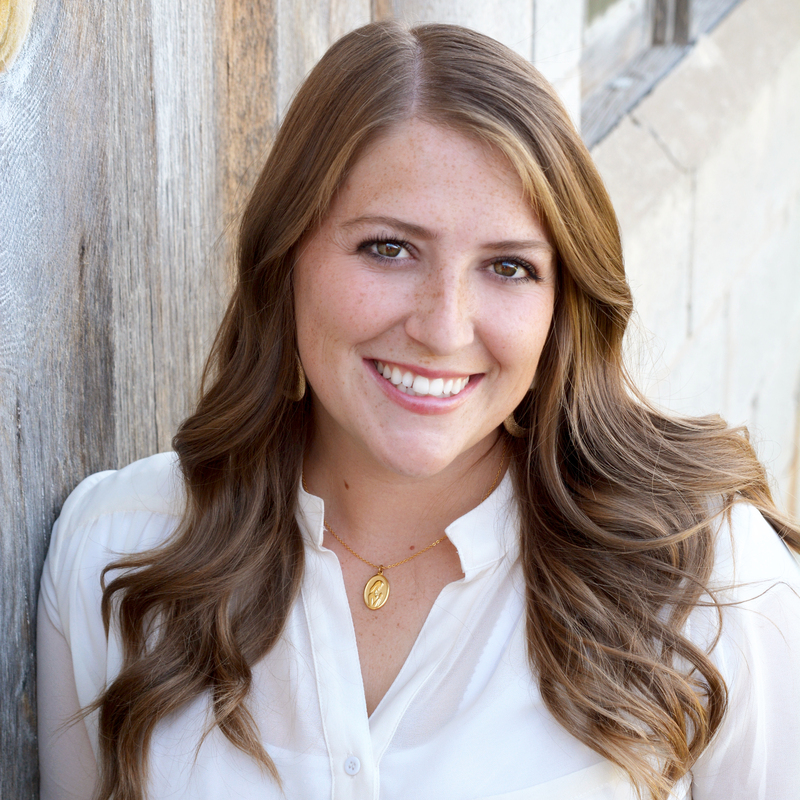 Now you’ve seen my must-haves, and I want to know what your favorite tools are. 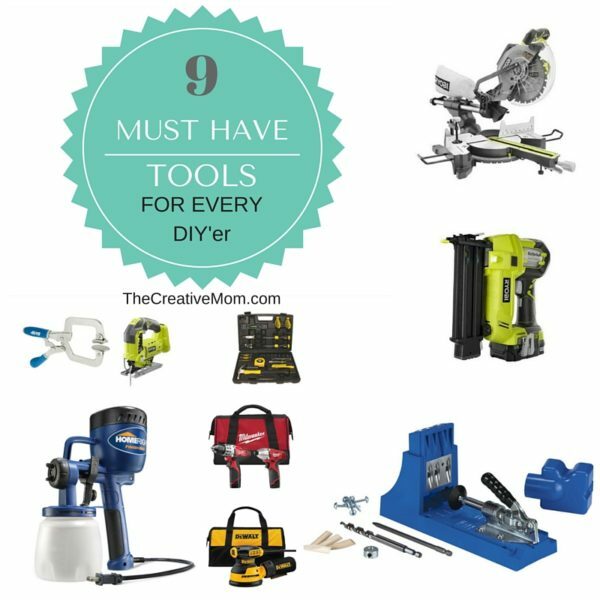 Did I miss anything you absolutely LOVE and can’t DIY without? Leave a comment below and let me know! Nice list…! I am glad to know that, this is very essential information. I get some essential brand tools information. This is a very helpful post for me. Thanks for sharing your post. Wow! just amazing tools. I have a plan for organizing my tool so I wanna buy Stanley tool kit. I think Stanley can be the best tool for my job. Thank for sharing this article! Got valuable information after reading it!